Markus Howard of Marquette was awarded an NCAA statistical plaque for having the nation’s best three-point field goal shooting percentage in 2016-17. His teammate Sam Hauser is currently second in the nation for the 2017-18 award, but two non-NCAA teams may keep him away from the hardware. Some rules related to the honor are fairly simple: you must make at least 2.5 three-point field goals per game and play in at least 75% of your team’s games. That’s why you don’t see Michigan State’s Cassius Winston on the leaderboard despite his lofty 56.5% shooting from deep this season. He’s only 70/124 in his team’s 31 games (31 x 2.5 = 77.5). Just prior to the start of the 2016-17 basketball season last November, we stated that Richard Pitino was not on the hot seat. 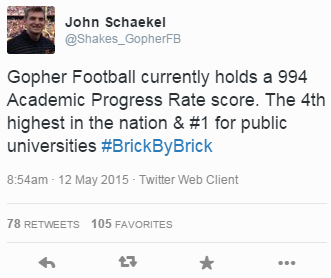 There were three reasons for this: the team’s outlook, his large buyout, and the program’s APR. Our claims that most people were underestimating the team and that they projected to be set for a strong 2017-18 were proven to be true. From here, things could continue to go well (e.g., a strong 2017-18 season, great success on the recruiting trail), or they could become more challenging. However, due to the other two issues, the seat still probably won’t get hot soon even if team performance and recruiting go south. Minnesota’s Largest Exposure in Mbakwe Mess Still Looming? University of Minnesota star forward Trevor Mbakwe may receive additional punishment on Friday from a Miami-Dade court related to his felony battery due to a summer probation violation. While the punishment could include jail time and further negatively affect the Minnesota Gophers basketball team, there may be an exposure outside of the courts for the university that is more significant than anything the judge will hand down this week. My reporting on the felony issue over the years has been met with denial and attacks, but this week, after LateNightHoops.com broke the news of the latest troubles in Miami, people are beginning to understand the history and severity of this matter. It can be difficult to determine the reasoning of the NCAA when they decide to grant a sixth year of eligibility to a student-athlete, especially when it doesn’t appear that any of the listed criteria for a Five-Year Rule Waiver are met. With regard to Mbakwe, I had put his chances of being granted a waiver at 2% when he went down at the Old Spice Classic last November. The reasoning for this was that I firmly believed that the felony battery case, which continues to be misreported by most media outlets, would likely end in a plea agreement and a finding of guilt by the court. It did. Still, the waiver was granted. Mbakwe was falsely accused. It was a case of mistaken identity. We held him out for a year because it was the right thing to do for the school and for him. He was never convicted. Surely this legal issue was no fault of his own and therefore the NCAA should grant him an additional year of eligibility. 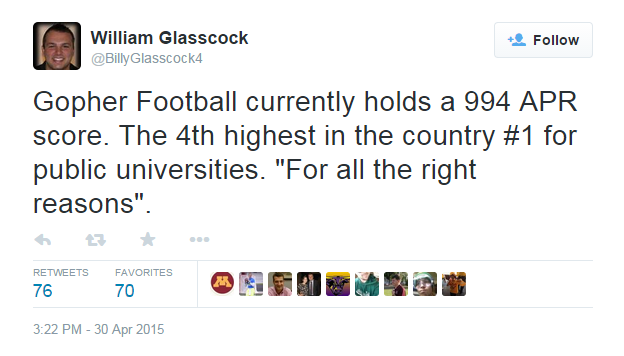 This argument may be compelling to a third party such as the NCAA. Technically, this is an argument that could have been made and while misleading, might not contain any blatant lies. In the state of Florida, a plea of no contest is available and that is what Mbakwe pled in February of this year. A no contest plea is frequently used by defendants in Florida and simply means the defendant does not wish to contest the charges. Before accepting the plea, the court would have made certain Mbakwe knew he was accused of assaulting a young woman and would be found guilty by the court of a second degree felony. Another practice that is not rare in Florida is for a judge to “withhold adjudication”. This means that while the court finds an individual guilty, he is not “convicted”. This can be beneficial for the defendant in that certain civil rights may be preserved (i.e. voting, right to bear arms. Editor’s Note: Our understanding is that Mbakwe is registered to vote in Minnesota and is considered to be a “convicted felon” under state statutes that cover voter eligibility despite the withhold as long as he remains on probation; therefore, it appears he’s currently unable to legally vote, so the withhold doesn’t have the same benefit as it may if he lived in Florida). So, was Mbakwe convicted of the felony? No (although he may be this Friday). Was he found guilty? Absolutely. We held him out for a year because it was the right thing to do for the school and for him. He was later found guilty of felony battery. You should grant him another year since we decided to sit him because of a felony charge that he was ultimately found guilty of. This argument isn’t so compelling. Now, I don’t know what the discussions between Minnesota and the NCAA were. I do know that the Five-Year Rule Waiver being granted was very surprising to me and based on the facts at the time (Mbakwe had been found guilty prior to Minnesota’s petition), it brings into question what information was discussed when the NCAA was making their decision. On course, the argument for a waiver may have been completely unrelated to Minnesota’s decision to sit Mbakwe in 2009-10. I doubt it, but I do not know. If Minnesota’s request for a Five-Year Rule Waiver excluded relevant information, there may be reason for deep concern. The question would then be whether it was a case of ignorance or intentional deception. Neither one would be looked upon favorably.